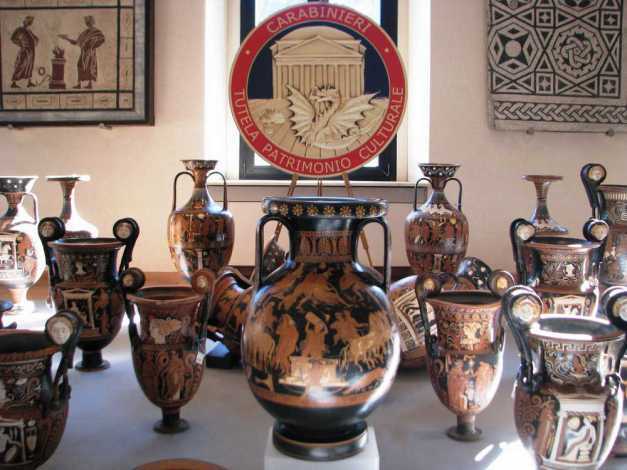 The recent photographs of the stalwart carabinieri in front of the 5,000 stolen antiquities do, however, invite a fundamental question. Where should they go now? Because they were not properly excavated by archaeologists, they tell us nothing beyond the evidence of their own being and so add very little to the story that museums are already telling. Many are not even intrinsically rare or very beautiful. We asked a top dealer and an auction house in London to select and value some pieces that they knew were exceptional and then some ordinary pieces, and, finally, to give a rough valuation for the whole group. It came to €15m, and although this is considerably less than the €50m boasted by the Italian authorities, it is still a useful sum of money. It might make it possible for the museum of ancient Roman ships near Pisa to open. The 30 vessels, some of them wonderfully intact, were dug up in 1999, but no one can get to see them. The same goes for the other museum of ancient ships, near Rome, which has been closed for 12 years. Or there is the city of Rome’s old Antiquarium, which has been closed since 1939, while the new one near the Colosseum has been rebuilt, but is also closed. Or the archaeological area called the Horti Lamiani, also in Rome, with 1,600 sq. m of coloured marble and painted walls, not to mention 8,000 drawers of finds. This has had the complete museum treatment, but has never opened. Then there is the Museo Archeologico of Licata near Agrigento in Sicily, closed since 2008, while tomb robbers dig with impunity at the nearby site on Monte Sant’Angelo (and in what used to Etruria and Magna Graecia). All this information and more comes from my journalist friend Tina Lepri, and it is a scandal. Budget cuts have hit Italian heritage sites very hard, and these funds are needed badly. But the Italians just don’t seem to view their heritage this way. Sell them, with an attached provenance. The authorites will save money on storage and associated costs as well as getting income from the sales. When you say “the Italians don’t seem to view their heritage this way,” which “Italians” are you talking about? The ones in the cultural ministry and state supported archaeological positions or Italian taxpayers and the thousands of Italians who collect ancient artifacts, particularly coins. I suspect the latter groups would welcome this proposal. Looks like some bloggers associated with the archaeological lobby have taken the Art Newspaper to task for running this editorial. One says a new British Museum Associations stricture against deaccession argues against this proposal, but the British Government does not lay claim to every artifact found in Britain so museums are not inundated with finds. The other suggests that Italy is too corrupt for this to work, but if finds are sold transparently through auction and the funds tracked, this should not be a real issue.